EAST HARRIS COUNTY  The federal Environmental Protection Agency announced last Wednesday that they were extending the comment period for the public to express their opinions on whether the toxic waste pits should be removed, or a cap built over them and let them stay in place. EPA granted a 45 day extension, with final comments due by January 12, 2017. The EPA had announced on September 28 that the Proposed Plan they preferred called for removal of most of the toxic wastes, in the North and South impound areas. They would, however, allow some material to remain if its toxicity was below acceptable standards. Although this extension came as a surprise to the parties who have been involved in the long Superfund process, nevertheless it is within the guidelines of these types of federal procedures. Any party can request a hearing, or an extension, and the EPA determines whether it is a reasonable request. In this case, authorities indicated that several parties had made requests for an extension. All of them are proponents for leaving the waste pits in place, it was learned. Jackie Young, the leading advocate for completely removing the waste pits, expressed a concern that the extension allows more time for the opponents to organize or solicit comments in favor of their position, to leave the wastes in the river. The Winstead Law firm, representing the Potential Responsible Party McGinnis Disposal, asked for an extension of 90 days on October 28th. Remedial Project Manager, U.S. EPA Region 6, 1445 Ross Avenue (6SF-RA), Dallas, Texas 75202. Jackie Young indicated that she would call a news conference on this subject, on Friday of this week, and release a statement to the media. At a public meeting on October 20, Gary Miller of EPA reviewed the history of the Waste Pits site, since its start in the 1960s, and its rediscovery forty years later. He detailed how the proposed plan called for a 19 month removal of 152,000 cubic yards of material on the north impoundment, and the backfill with 2 feet of clean soil. On the south impoundment, 50,000 cubic yards will be removed, and a building removed and replaced. 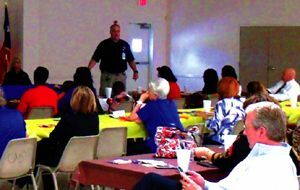 HIGHLANDS  Earl Smith of the Harris County Citizen Corps of the Homeland Security & Emergency Management gave a presentation at the Highlands Community Center for the Highlands-Lynchburg Chamber of Commerce on Nov. 10 concerning preparedness for emergencies. Making a kit involves having at least seven days supply of water one gallon per person per day. The home will need at least seven days of food supply of nonperishable canned food for everyone in the household. A first aid kit is recommended. The kit will need a flashlight with extra batteries, a battery powered radio, all the medications and special items needed for regular subsistence, tools, toilet paper, personal hygiene items, changes of clothes and bedding, cash and important family documents, copies of your critical information and provisions for pets. Then there is a need for updating and refreshing these items. The first disaster tackled by the Mr. Smith with assistance from Julie Oates of County Judge Ed Emmetts office was hurricanes and floods. What is the greatest danger from hurricanes? The tidal surge answered the listeners. Floods are Harris Countys most common natural hazard. Listeners were advised to keep up with news reports, fill bathtubs with and all available containers with water, turn off utilities if requested, remain indoors away from windows, and cover family members with a blanket or furniture to protect from flying objects. If ordered to evacuate, know the local hurricane evacuation route(s) to take and have a plan for where you can stay. If you are not in an area that is advised to evacuate and you decide to stay in your home, plan for adequate supplies in case you lose power and water for several days and you are not able to leave due to flooding or blocked roads. Make a family emergency communication plan. Many communities have text or email alerting systems for emergency notifications. Remember to keep generators and other alternate power/heat sources outside, at least 20 feet away from windows and doors and protected from moisture; and NEVER try to power the house wiring by plugging a generator into a wall outlet. Consider building a FEMA safe room or ICC 500 storm shelter designed for protection from high-winds and in locations above flooding levels. Harris County residents are also subject to hazardous material incidents. During such an incident local officials may ask residents to shelter in place instead of evacuating. When called for staying indoor until the emergency is over is advised rather than going outside and exposing ones self to exposure. Residents are then advised to turn off air condition and prevent chemical vapors from entering. Choose a room to stay in with few openings like windows or doors. Finally, the get involved aspect is to join the Harris County Citizens Corps Harris. A new website was launched in September for County Citizen Corps website: www.harriscounty citizencorps.com. It provides emergency preparedness resources and the latest news and information. Since its inception in August of 2002, Citizen Corps has been coordinating the training and education of thousands of volunteers in an effort to build a strong partnership between residents, local leaders and emergency responders. Harris County Citizen Corps membership includes 28,864 trained volunteers involved in 254 Community Emergency Response Teams; 21,892 volunteers from 24 Volunteers in Police Service agencies; 4,165 volunteers from the Medical Reserve Corps; 6,137 volunteers from the 351 neighborhoods participating in the USA on Watch program; and 24 Fire Corps programs.